In Canada, families of four, with two parents and two children, and with a total annual income of $50,000 per year are penalized through punitive taxation if they have only one income earner and a stay-at-home mother, as opposed to families with two income earners and the same level of income. The "advantage" to families with two income earners is about $4,000 per year in subsidies, tax credits and daycare allowances. It appears that governments are trying their best to put mothers to work to have them, just as in the great communist nations, work for the greatness of the socialist state, but more about that later, after you read the following action alert from the Eagle Forum. The action alert draws draws the attention of people to the fact that the White House intends to emulate the punitive family policies of the People's Republic of Canada. Republicans and Democrats agree that the tax code unfairly penalizes marriage. Last year, President Clinton vetoed the bill that would have provided marriage tax relief to all married couples. The 107th Congress is drafting marriage tax relief legislation, but the White House tax plan undermines relief for all married couples. ARE YOU TWO-THIRDS OF A PERSON? The marriage tax is not verbally expressed as policy in any statute but is buried in the numbers. It is a consequence of the fact that our income tax tables treat a married couple as only 1.67 persons instead of two whole persons. The White House executive summary of President Bush's tax-cut proposal calls for "reducing the marriage penalty by reinstating the 10 percent deduction for two-earner couples." Not only does this proposal give less relief than the bill passed by Congress last year but, even worse, it would impose a new homemaker penalty on one-earner couples. Under this tax plan, homemakers would still be considered two-thirds of a person. THE PRICE OF THE HOMEMAKER PENALTY Consider what the Bush marriage tax cut would accomplish after becoming fully operative. A married couple is struggling financially and needs more income to support the family. In one family, the wife takes a job and puts her children in daycare. This couple would get a marriage tax deduction, which chops as much as $990 off the family's federal income tax bill (at the new 33 percent top Bush tax rate). In addition, this couple qualifies for the existing tax credit for child-care expenses, which is worth up to $960. Consider another family where the husband takes a second job so his wife can care for their children at home. This family would not qualify for either the new Bush marriage tax relief or the child-care credit that exists in current law. The husband and wife surely work just as hard in this second family as in the first. Why should they pay up to $1,950 more in taxes on the same family income? ACTION ITEMS The marriage penalty in the tax code is an immoral policy whether one or both spouses earn the family income. Giving a tax cut only to two-earner couples would send the radical feminist message that the government sees no value in a homemaker's work at home, and that the role of a "non-working" wife and mother is less worthy than paid employment. Marriage tax relief legislation should be the next stand-alone tax bill voted on by the committee. Reaching Chairman Thomas at the Ways and Means Committee (202-225-3625) is especially vital. The proposed tax plan is a manifestation of effective, time-worn and time-proven communist tactics to destroy families. It is bad enough that it is increasingly more difficult for families to adhere to the proven principle that if one parent stays home and only one parent works, the outcomes in children will be much better. Why, of all things, would a conservative government implement punitive taxation for two-parent, single-income-earner families that is worse than anything that the Clinton administration managed to throw at families in that respect? The $200 million in funding allocated under the US Fatherhood Act appear at first glance to be a measure that will strengthen families, until one considers that the funding will primarily address some of the consequences of divorce, separation and single-mother families. The act is to promote measures that will encourage fathers of children to become better providers for their broken families. It will, of course, have some benefits for married fathers as well, as it may establish measures by which the image of all fathers will be promoted. However, in the balance of things, the Fatherhood Act will do little to strengthen families. The Clinton administration implemented few measures to strengthen families, but it did much to provide measures for their planned destruction. In addition, the Clinton administration literally inundated the country with measures that address the outcomes of family break-ups, single-motherhood and lack of family formation, thereby providing enormously effective incentives that practically make any imaginable alternative "family-type" preferable to the real thing, the traditional nuclear family. Patrick Fagan, of the Heritage Foundation identified in a shocking summary the disparity between the two opposing directions of the US government's family policies. Now add to that the punitive taxation that the Bush administration intends to impose on the traditional nuclear family. It will not break all families, but it will be a considerable burden added to that carried by virtually all. 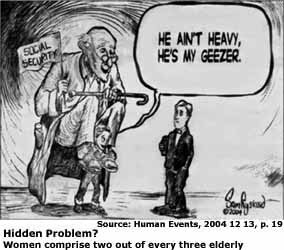 Many families will stagger under that burden. Many stay-at-home mothers will be forced to join the work force. Thereby their families will lose some of the stability they had. It will provide no benefits to society or to taxpayers to have mothers who would better stay at home forced into a surplus labour market in which already too many people compete for too few jobs. However, doing that will increase the demand for daycare, so that professional household engineers (as the early communists called them) can earn professional incomes while they care for the children of mothers who joined the work force to earn minimum wages. Note: The abolition of the family is one of four major aspects of socialism. That is because "abolition" implies in the minds of many people a gradual, somewhat benign cessation of family formation or of the existence of families (e.g. : "non-fault" divorce). In reality, "abolition" is not quite the correct term and the term "destruction of the family" more accurately describes the circumstances. At this website, the term "abolition of the family" is used infrequently and the term "destruction of the family" is used far more frequently. You can perform a site-specific search at the website of Fathers to find instances of web pages that refer to or discuss the destruction of the family. The Joseph Rowntree Foundation in the UK, a "pro-family" research foundation, that like so many other similar institutions over the years became gradually infiltrated by family-hostile and single-mother-friendly feminist ideologues, announced the results of a survey of the outcomes in children whose mothers joined the work force (references appended). When it came to fathers, the report said the fact that most of them were in full-time work during most of their children's upbringing made it more difficult to find a significant impact. But if fathers spent longer at work when their children were very young, it was likely to lead to a 6% reduction in the chance they had of getting A-levels. The JRF press release identifies the need for more paid maternity leave for mothers (fathers aren't important, because they mostly work full-time anyway and therefore no meaningful results can be determined). It is said that the results of the study should not be used to penalize mothers. In essence, what is being promoted is that it is good for mothers to stay home with their children, but that mothers should have the right to go to work if needed, even if only on a part-time basis. It is further said that for mothers to go to work is an absolute necessity for many families. The conclusion that one is left with is that if fathers don't earn enough money to provide for mothers to stay home in comfort, then the government might as well pay  as long as we can keep a happy balance between mothers being with their children and being at work while somebody else can do daycare for which mothers will pay with the minimum wages they earn at work, with the rest being covered by all taxpayers. The USSR had very similar policies for women in the 1970s and managed to put 85 percent of its women into the work force, to put their untapped potential to use in the construction of the great socialist state, as Chairman Mao said of similar efforts in the People's Republic of China. Today the Russian Federation has an 84 percent annual inflation rate, still a high participation rate of women in the work force, an enormous number of single mothers, a total fertility rate of one child per woman (the TFR required to maintain population levels is about 2.2 children per woman), children who are being cannibalized in the black market for body parts for the organ trade catering to the organ transplant industry, and mothers who receive a full two years of paid maternity leave. Russia expects to lose 50 million of its population over the next three decades, while elderly women scrounge for bottles to sell in efforts to buy a loaf of bread and a liter of milk. Russian men don't generally live to be elderly. The average life expectancies for Russian women and men are 72 and 58 years, respectively, with the suicide rate for men being seven times that of men in the UK. In short, the whole of Russia is in chaos, bankrupt, and we are getting there fast, too. We merely had a late start in the race to oblivion. Doesn't that prove that the government does not make a better provider and protector than husbands and fathers do? Isn't it great that we can thank feminism for its efforts to make that increasingly clear to us over the past 30 years? With experiences like that opening our eyes, who can honestly say that feminism didn't do a good service to all of mankind? What needs to be done to get out of the rut on the road to social(list) destruction? The Joseph Rowntree Foundation isn't helping much. The proposal by the White House for punitive taxation of families is far worse yet. The PDF document accessible there is nothing other than a copy of the summary that went out with the JRF's e-mail announcement. It appears to have been the source of the article written by Dominic Hayes, Education Correspondent, PA News. The full report by John Ermisch or Marco Francesconi may be available on-line somewhere. Maybe the report is available in the libraries. It might be worth it to look it over first to see whether it is worth buying.